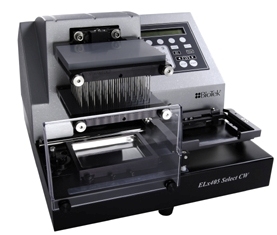 The new ELx405™ Select Deep Well Microplate Washer is a robot compatible, full plate washer incorporating BioTek’s patented Dual-Action™ manifold with independent filling and evacuation control for precise overfill washing and overflow protection. Available low-flow rates and angled dispensing make the ELx405 particularly useful in cell-based assays. Scientists regard unexpected clogging of manifold tubes to be the largest contributor to assay failure. Cleaning these tubes is a time consuming and labor intensive process. With optional Ultrasonic Advantage™, BioTek washers are the only products available today with built in ultrasonic cleaners able to automatically prime with cleaning solution, sonicate tubes to remove any protein or salt crystal build up and re-prime with rinse or wash buffer leaving the instrument clean and ready for its next wash.